In an official preliminary finding published on Tuesday, the European Union's antitrust watchdog said it believes Apple is receiving special treatment from Ireland in the form of tax agreements, a situation that constitutes state aid and could therefore be viewed as illegal. 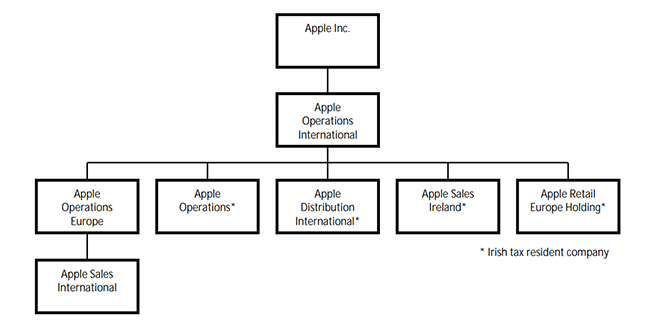 As outlined by the European Commission, Ireland's 1991 and 2007 tax deals with 100-percent Apple subsidiaries Apple Operations International, Apple Sales International and Apple Operations Europe constitute an existence of aid by an EU member state. The commission made the document available through its website on Tuesday (PDF link). In the light of the foregoing considerations, the Commission's preliminary view is that the tax ruling of 1990 (effectively agreed in 1991) and of 2007 in favour of the Apple group constitute State aid according to Article 107(1) TFEU [Treaty on the Functioning of the European Union]. The Commission has doubts about the compatibility of such State aid with the internal market. The Commission has therefore decided to initiate the procedure laid down in Article 108(2) TFEU with respect to the measures in question. Ireland is one of the stops used in the famous —and legal —"Double Irish with a Dutch Sandwich" tax strategy used by multinational corporations to save billions of dollars. The EU has taken interest in companies like Apple, which route money through subsidiaries in Ireland, because the strategy allows companies to avoid paying higher tax rates in individual countries. Intellectual property licensed in Ireland is then assigned to an offshore entity located in a no-tax country, like the Caribbean, meaning Irish tax is not applicable to said income. Income from international sales is funneled through another subsidiary in the Netherlands to further avoid EU taxes, which the union believes is unfair. The tactic has reportedly saved Apple up to $9 billion per year. Apple is proud of its long history in Ireland and the 4,000 people we employ in Cork. They serve our customers through manufacturing, tech support and other important functions. Our success in Europe and around the world is the result of hard work and innovation by our employees, not any special arrangements with the government. Apple has received no selective treatment from Irish officials over the years. We're subject to the same tax laws as the countless other companies who do business in Ireland. Since the iPhone launched in 2007, our tax payments in Ireland and around the world have increased tenfold. To continue that growth and the benefits it brings to the communities where we work and live, we believe comprehensive corporate tax reform is badly needed." The statement echoes comments made in June when the EU investigation began, as well as stateside calls for tax reform in a series of U.S. Senate hearings. It was reported on Sunday that the EU would pin the tax burden on Apple and seek fines or other punitive action against the company, but those rumors were later debunked as coming from misinformed sources. Ireland, Apple and interested parties have one month to furnish the commission with a reply and financial documents pertaining to Apple's annual income, employee status and subsidiary cost-sharing agreements, among other details.